Last week, a federal judge protected Illinois’ Future Energy Jobs Act, which is expected to grow the state’s solar capacity to over 3,000 MW by 2030 – enough to power approximately half a million homes. 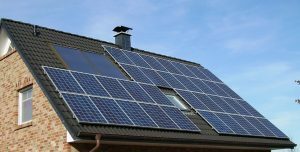 The expected influx in distributed resources like solar panels prompted the Illinois Commerce Commission (ICC) to set in motion NextGrid, an 18-month study focused on rethinking the roles of the utility, the customer, and energy solution providers in a 21st-century electric grid. A large part of NextGrid involves advanced technologies like the smart inverter, a disruptive technology with the potential to improve grid reliability, create economic value for customers, and lower pollution. Most of the electric power entering our homes, offices, and factories from the grid is in the form of an alternating current (AC), which allows for greater efficiency given our existing electric system design. Solar panels and batteries, in contrast, produce electricity in the form of a direct current (DC). In order to integrate these distributed energy resources into the electric system, a device called an inverter is used to convert DC to AC. To be considered “smart,” an inverter must have robust software and be capable of rapid, bidirectional communications. Historically, inverters operating behind distributed resources would immediately shut off during any disturbance to the electric grid. For example, when there is a sudden increase in electricity demand, the grid may have fluctuations in frequency. Previously, solar inverters would immediately shut down once the grid’s frequency or voltage went outside of normal operating levels. Smart inverters, on the other hand, can support utilities’ efforts to stabilize the grid during disruptive events. Through seamless communication between grid operators and the inverter, utilities can remotely control these technologies to help with issues such as voltage and frequency fluctuations – if policy and regulations allow utilities to do so. Hawaii is working closely with inverter manufacturers to improve grid stability. Arizona has deployed pilot projects that use smart inverters to operate a fleet of rooftop solar as though it is a traditional power plant. California is tackling the communication standards behind smart inverters, focusing on common language between the grid and the inverters. Initiatives like these are beginning to show that smart inverters can provide crucial services that enhance grid reliability. If NextGrid is successful in creating an animated market, there likely will be an influx in compensation for alternative services. Therefore, as smart inverters and other advanced technologies become a fundamental component to the modern grid, they have the potential to enable new markets and add economic value. If Illinois’ NextGrid is successful in creating an animated market, there likely will be an influx in compensation for alternative services, including smart inverter capabilities, allowing entrepreneurs and savvy customers to earn money by providing these services. In addition to increased grid reliability and economic opportunity, unlocking the full potential of these intelligent power-electronics can lower air pollution in Illinois. By allowing for the integration of more clean energy – like solar panels and storage of renewable energy – onto the grid, smart inverters could lower reliance on traditional fossil fuels that pollute. Illinois and many utilities around the country are exploring how to maximize new grid technologies such as smart inverters. Through the Future Energy Jobs Act and NextGrid, Illinois has the opportunity to enhance reliability, open up new markets, and empower customers, while creating an electricity infrastructure that supports cleaner energy. This entry was posted in Grid Modernization, Illinois. Bookmark the permalink. Both comments and trackbacks are currently closed.